This Gotham Bar and Grill exclusive is a Chef Portale classic. Miso Marinated Black Cod. bok choy, shiitake mushrooms and sticky rice, soy lemongrass ginger sauce. When tasting events and celebrity chef meetings become more frequent, we’ll be delighted to start a whole series about Airlines feeding us on the ground. In the meantime, it’s a special occasion that has us with Singapore Airlines at Gotham Bar & Grill sampling dishes created by Executive Chef Alfred Portale who’s also a big part of Singapore Airlines International Culinary Panel. Singapore Airlines’ International Culinary Panel includes Alfred Portale, long-time Executive Chef at New York City’s Gotham Bar and Grill. Chef Portale has been at Gotham for over 20 years and working with Singapore Airlines for the past 11 on projects that include his participation on the culinary panel. Today we sample creations that are offered on the Gotham menu that give us a feel for the influence he has on Singapore’s premium cabin menus. Over lunch, I got to chat with with James Boyd, Singapore Airlines’ VP of Communications in the US to learn about premium cabin meal services like “Book The Cook” and International Culinary Panel programs while learning more on the chef’s influence and how this experience on the ground translates in the clouds. *Pictures shown are from our lunch at Gotham Bar and Grill in New York City. Dishes are not actual Singopore Airlines menu items but are creations of Executive Chef Alfred Portale who sits on Singapores’ International Culinary Panel. Redman : Okay. So just explain a little bit about what the Book the Cook, is and how it works? Boyd: The Book the Cook is a service that allows passengers the flexibility of pre ordering a meal up to 24 hours in advance of their flight. So there are a number of favorite dishes that our customers tend to have and they really appreciate the ability to have that sense of control over their itinerary in-flight experience. So the ability to know that from JFK to Frankfurt, I’m having a nice steak and from Frankfurt to Singapore I’m going to have the Lobster Thermidor, it’s a point of familiarity for all of the customers and again, they really like the sense of control over their experience. Redman: And… the dishes that are offered are based on your departure or arrival city? This Gotham Bar and Grill exclusive is a Chef Portale classic. 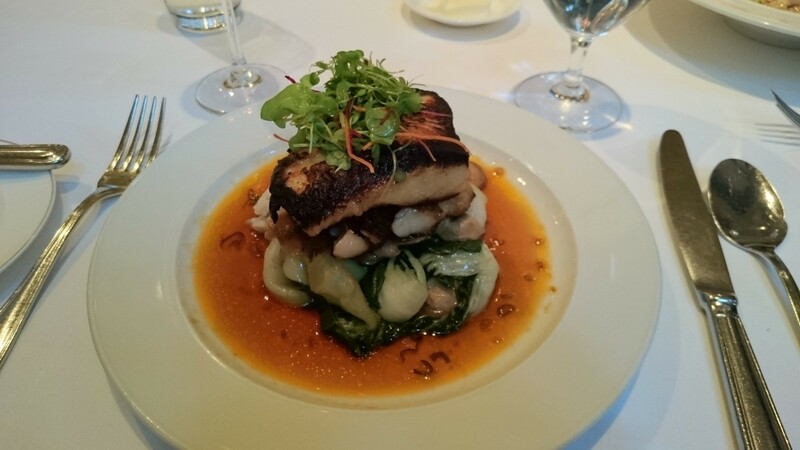 Miso Marinated Black Cod. bok choy, shiitake mushrooms and sticky rice, soy lemongrass ginger sauce. Boyd: Actually there are two different systems within our in flight culinary program. One is the one that you mentioned, the Book the Cook program where you can order, you have the control of ordering your meals in advance. Those come from a specific menu dishes. And you can access them from our website at Singaporeair.com. The other is the international culinary panel, and that is our group of nine different chefs from all over the world who are contributing concepts and dishes to our menus that you would just basically find at meal time. 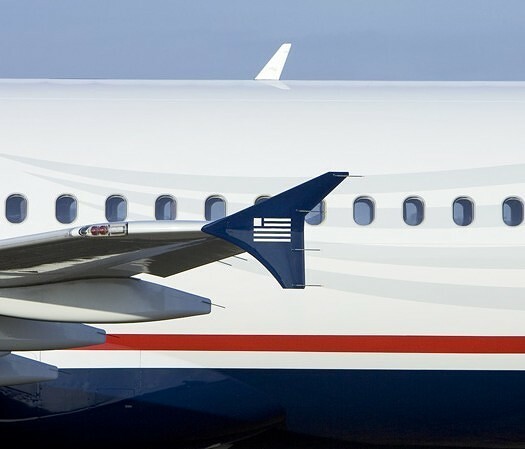 So the two programs are very distinct, but they are both really focused on giving passengers a heightened culinary experience on the aircraft. Redman: Okay, to be clear as an example, if I am flying from JFK to say Frankfurt, are (meals) based on where you are going to or coming from? Boyd: Yes, for example if you look at our wine program. On our flights to Germany, Germany you will find German Rieslings, you’ll find wines that are indicative of your destination. The same thing if you were flying from Seoul to San Francisco. You are going to find wines from what we’d like to call wines new world wines from Napa and Sonoma. So we do try to link the destination with the kind of product that you would have in-flight. Even when you look at something as basic as our Lite Bites menu. You’ll find a lot of local favorites. For example there was a program that we offered for flights from Los Angeles to Tokyo. We offered Randy’s doughnuts as part of the Lite Bites menu. And if you are from Southern California, if you are from Los Angeles, you’ll know Randy’s doughnuts and the passionate following that they have. So it’s really about giving the customer a sense of familiarity, a little bit of comfort food, just to create that moment of satisfaction, using food as a tool for doing so. Redman: Who gets to choose which chefs make it onto your culinary panel? And what goes into that process? After a filling meal, we opted for just a scoop of salted almond ice cream, normally served aside the decadant Gotham Chocolate Cake. Boyd: We have a literally, I personally consider to be a culinary genius, and that’s our head of food and beverage in Singapore. His name is Herman Friedrich who is deeply, deeply entrenched in the global gourmet food world and the world of top chefs. Very often recommendations for new international culinary members comes from members of the panel members themselves. For example, we’ve worked with Alfred Portale here at Gotham Bar and Grill in New York for almost eleven years and when the time came for a new international culinary member to represent West Coast culinary sensibilities, it was actually Alfred who recommended Suzanne Goin to us. And so obviously she came very highly recommended by someone we know and trust but also her own bona fides were more than sufficient to help us make the decision that she was the person to really represent that style of fresh, inventive, luxury California dining to us. Redman: So you will take a good recommendation? Boyd: Happy to, happy to. Redman: How is the precision and detail that a chef like Alfred Portale puts into the dishes translated into Singapore’s catering and ultimately the flight crew that puts together the dishes onboard? Boyd: You know, it’s a lot more complicated that you can imagine. Onboard the aircraft we don’t have the benefit of refrigeration, of knives, of open flames, but our customer expects and what we strive to provide our customer is the same kind of, the same quality of dining experience that they would have in a five star restaurant on the ground. We have to take many, many more steps to achieve that at 39,000 feet going at 500 miles an hour than you would have to look after in a restaurant on the ground. So what we do is we work with the culinary panel chefs for their inspiration, then they actually present the dishes and give a complete tutorial … demonstrating to our in-flight kitchen chefs, Alfred’s intentions, his philosophy, his approach to that specific dish. Then we go back to Singapore and they figure out how to replicate that in a kitchen that produces about 65,000 dishes per day. There’s a completely different process whereby we cook the food about 40% in the kitchens. It goes into a blast chiller, it goes into the carts onboard the aircraft. And then we have to go through the process of reheating the food at meal time. So we’ve learned a lot of real innovative tricks in terms of how you can reheat a steak onboard the aircraft so that it comes out to the customers desired level of doneness when it’s presented to them. So there are a lot of additional steps that we have to take on the industrial side of the airline in order to really replicate the finished product that you would see here in the dining room at Gotham Bar and Grill. Redman: Do the chefs whose ideas you employ get to test these things in context? Boyd: Absolutely, in fact our international culinary panel chefs will fly with us several times a year. They will attend our menu presentations, which is our caterers here at JFK presenting their best interpretations of Alfred’s dishes to our executives and very often to the chef himself. At that point we can make lots of modifications on the dish if necessary. Once the dish is approved at the catering facility, it’s photographed and that photograph goes into what’s known as a plating guide, which is on the wall of each gallery every time the dish is prepared. So that our cabin crew can flawlessly replicate the layout of the dish before it is presented, before it’s plated and then presented to the passenger. So it’s detailed multistep, literally multi-continent process, but absolutely nothing is arbitrary. It is all processed within and no one loses sight of that goal of that moment of service that is supposed to happen when the dish arrives at our passengers linen covered tray table. Redman: Translating the on ground experience, the at home experience to the flight? Gotham Bar and Grill’s Seafood Salad. 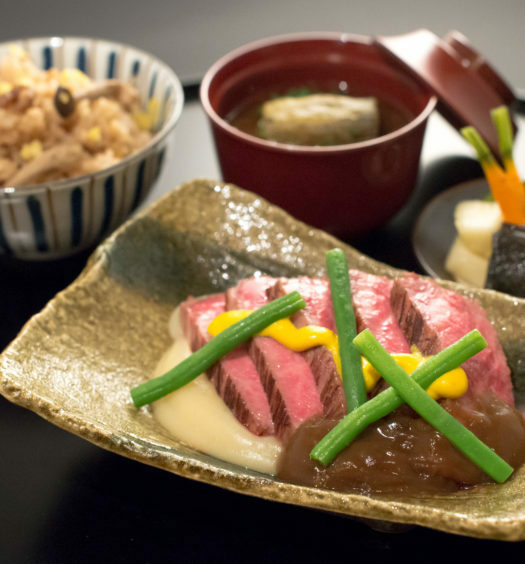 Autumn Menus on JAL are Full of Great new Upgrades.